Gore Vidal? Lewis H. Lapham? Fictional? Anonymous? Clearly this is a guiding principle to a large cohort, but I think it is an eccentric recommendation. Could you determine if Vidal did say this? I do recall seeing him on television multiple times, so maybe he was following his own counsel. Quote Investigator: Evidence indicates that Vidal did say a version of this quotation in the 1970s. He was interviewed on the Charlie Rose television show in 2009 and was asked about this saying. He replied that the adage was his, and he originally said it to Diane Sawyer the network correspondent who is now a prominent anchor. QI has not yet located a transcript of the colloquy between Vidal and Sawyer. 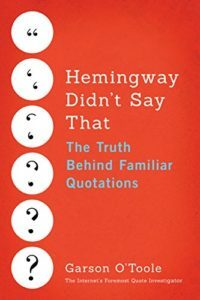 The earliest instance of the quote QI has found appears in the magazine Harper’s in a column written by the editor Lewis H. Lapham in October of 1978 where the words are credited to Gore Vidal.